Dear Readers, IBPS RRB Office Assistant Prelims Exam is started from 18th August 2018 and The exam will be conducted in 4 shifts each day on 18th, 19th, and 25th August 2018 and This article is based on IBPS RRB ALP Exam Analysis & Questions Asked: 18 August 2018 - All Shifts will let you know the detailed analysis & difficulty level of the exam topic wise & slots wise. Moreover, you can also know the number of good attempts that will keep you at safer side. So go through this IBPS RRB Office Assistant Analysis. We hope that you have prepared well for the examination to get through it. CI - P=2000, Rate=20%, Time = 18 months, then find the half yearly C.I? What is the 10th letter of the Alphabet if counted from the right? What is the angle between minute and hour hand at 3.47pm? What is Goitre related to? Where does the development of Embryo take place? Which element supplies oxygen to the body? Which substance doesn't react with water? Which substance doesn't react with Oxygen? Which of the following is a bisexual plant? Where did the Paralympics Summer Games 2016 held? Who is the finance minister of Haryana? On which date was Demonetization done in India? Ram Vilas Paswan is an MP for which Ministry? Author of the book "An Era of Darkness"? What is THUMBA famous for? 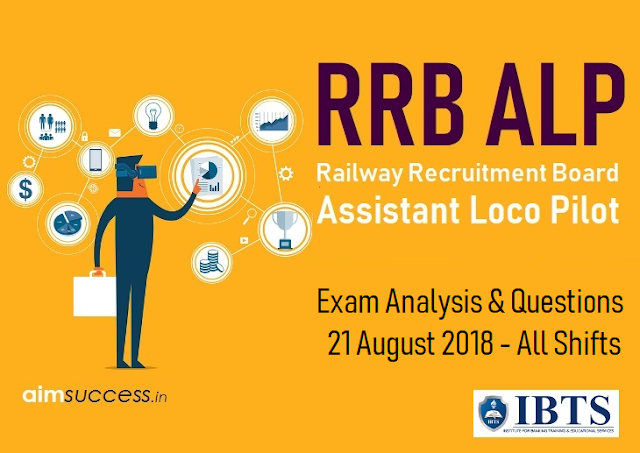 The first shift of RRB ALP 21st August Exam was Easy to Moderate in difficulty level. Candidates found some questions very new and difficult to solve but most of the questions were expected. What should be added to 5024 to make it a perfect square? A does a work in 10 days and B does a work in 15 days. B has started the work and A joins if to complete the work after 5 days. If they get Rs.60 for the work, then divide it among A&B? In a polygon, n=11, then find the number of diagonals? If (x-2)is the factor of the equation x^2-6x+k, then find the value of k? What is the name of male reproductive hormone in humans? What is the valence electron of Phosphorous? Ratio of Hydrogen and Oxygen in H2O? Who is the Brand Ambassador of Hyundai? Where is the Asian Games 2018 held?